In the vibrant culture of bodybuilding, nothing comes easy. Shaka earned spectacular results by paying with time, effort and discipline. See what put him on stage! I have always been active, primarily swimming and playing water polo through college. In college I was introduced to the weight room and wanted no part of it. It was foreign to me and I felt fit and initially couldn't see how it could benefit me. After college without sports to remain active and fit, I returned to the gym and just started to learn, and what I learned I began to love. I continued to remain in shape and hit the gym, but it wasn't until I moved to LA last year to pursue acting and fitness modeling that I really focused on competing. I was fortunate enough to meet and start working out with James Ellis, a seasoned fitness model and competitor in the industry who encouraged me to compete. He stepped up my training to a new level. Everything he did in the gym was technical, there wasn't one thing that was not deliberate from the number of reps, to precise angles, and even speed of the reps at different parts of the motions for certain exercises. Adopting this level of consciousness for my training made a huge difference. We went to check out the new Men's Physique division in March 2011, where I saw now IFBB Pro Alex Carneiro take the Overall. I saw great athletes competing and wanted to be a part of it all. 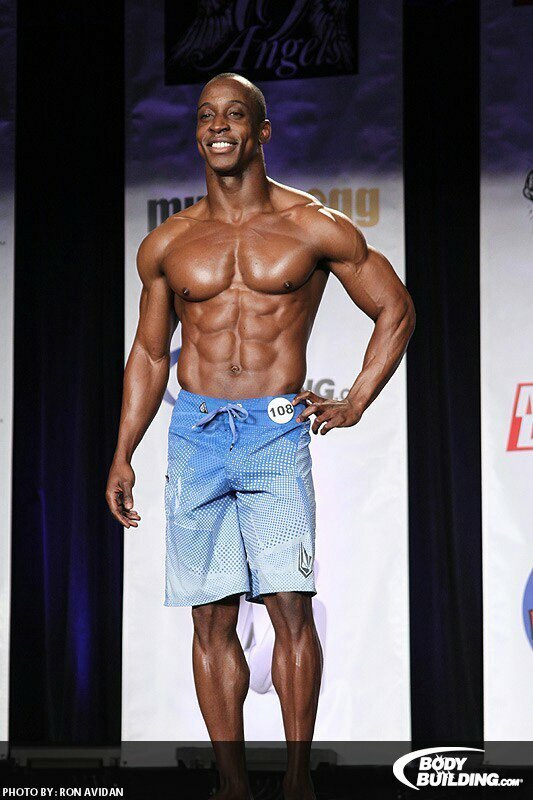 After watching that competition I decided to step on stage in April and I was hooked! Workouts with an emphasis on performing high reps and using lower weights have worked out best for me. I like to hit 80-105 reps per muscle group at 10-30% of my 1MR. The goal for me is to do 100 reps in one set and add some weight when I can achieve that. If I can't, I break it up to manageable sets or drop the weight further until I can. Every 3 months, however, I throw in about two weeks of heavy training to keep my body guessing. I like to do full body workouts almost every day and training heavy I would have to rest what I trained, making consistent full-body workouts far more difficult. Now I am able to train muscle groups more frequently. I also do 30 min - 1hr of cardio every session: I maintain a moderate speed (fast walk or slow jog) on max incline and perform interval sprints. Since I stay lean all year I just try to keep a balanced diet, for the most part. Two weeks before competition however, I drop my carbohydrate intake and do a short form carb cycle. Every Thursday day during my two week pre-comp diet, I add in an extra meal of either chicken or fish and drop the rice and salad from all meals and on the following day (Friday) I go back to the maintenance diet, before repeating for the second week. 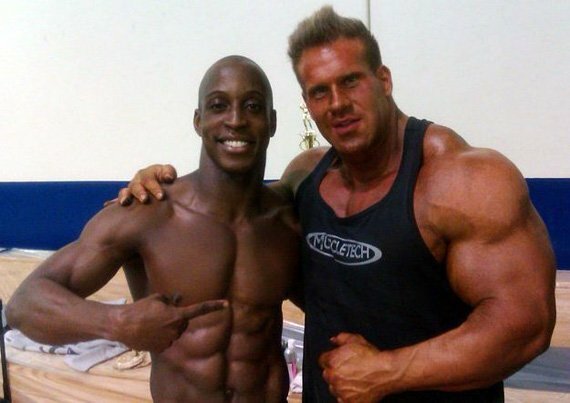 Sure, Jay Cutler's guns are as big as Shaka's thighs, but he'd win every foot race against the 4-time Mr. Olympia! Shakeology, Nitrocore 24 and Assault. Well first let me say, the greatest gains came from actually paying attention to my diet - no supplement will substitute the gains that can be made from a good diet and exercise routine. In a little more than 3 months, I was able to put on about 15 pounds of muscle and remain lean throughout by getting strict with my diet and training. As for Shakeology, Nitrocore 24 and Assault, Shakeology is a blend of whey protein, vitamins, minerals, antioxidants, and super foods which I take in the mornings - it keeps me full and nourished and helps me stay lean year round. Nitrocore 24 is a great blend of fast and slow acting proteins that I like to have before bed to keep my muscles fueled while I sleep. Assault is a great pre-workout. I try to confine my use of pre-workouts until about 2-3 weeks before competition. Assault has the right mix of Beta-Alanine, Creatine, Arginine and other aminos that work really well for my body and energy in the gym. I love fitness/bodybuilding because it keeps me motivated to live an active healthy lifestyle. I love it because as I get older I want to continue to enjoy an active lifestyle and through remaining fit, I know I can. I also love that it is one of the few things in life you have a fair amount of control over. I really enjoy changing my diet or training even in slight ways and seeing direct results. I also love competing and the training leading up to competition. I live for the feeling of focus I get when I am prepping and the rush on show day. Among the competitors, I also love the support we give one another. The camaraderie in the Men's Physique division has been amazing. Of course, we are all individual competitors trying to win, but there is also a sense that we are in this together as we seek to bring our collective best to the stage. Competing motivates me to follow a healthy lifestyle. More than this however, I want to enjoy a certain quality of life as I get older and to be around to enjoy moments with family and friends. I have just seen many people regret not having made wise health decisions when they were younger and have seen the effects first-hand of poor health on the young and old. I have always had a sense that if I am healthy and fit, I can deal with whatever life throws at me, but health and fitness come first. My mom made me want to achieve my goals. She instilled in me a sense of needing to complete what I started and do so at a high level. I was fortunate to get this motivation and drive at a young age. I think it is important to instill great values in children, but unfortunately fitness is one of those values often overlooked. My mom pushed me into sports early on and encouraged me to stick with it and I attribute my motivation and desire to achieve my goals to those early lessons. I do my best to motivate young people to get involved in sports and pay attention to their health; building good health habits early can avoid a lifetime of problems. I plan to compete next on May 19, at the Junior USA Championships in South Carolina in hopes of earning my IFBB Pro Card. Do it for you. This is a sport where we make changes based on the recommendations of others, be it judges, trainers, fellow competitors etc., but ultimately you have to want to make those changes for yourself as well. If you don't, you won't be a happy competitor and that will come through on the stage as well. So, do it for you and enjoy the ride! My list grows as I meet more people in this industry - I am very fortunate to be a part of it. To name a few though, James Ellis who has been a great mentor, Jay Cutler whose drive and humble nature I have always been impressed by, Greg Plitt who doesn't seem to have an "off" button and is a constant motivator, and Charles Glass, the Godfather, who is an inspiration in every sense of the word. I really love this industry and the people in it - no list of my favorites will ever be long enough. I love BodySpace and I love reading the forums and checking out all the competition updates and pictures. 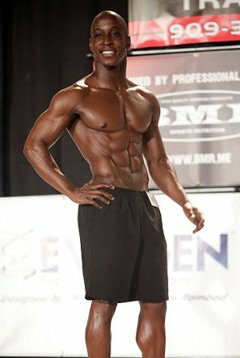 Bodybuilding.com was the first place I turned to learn more about pursuing my fitness goals - it's been a great resource.